Well done on your first colour challenge entry Brenda – and perfectly linked up! 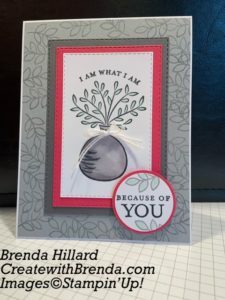 And what a pretty card it is too: I love the way you used the rectangular layers to draw the eye in to your focal point vase, and the tone-on-tone leaf stamping on your outer frame coordinates beautifully. Thanks for playing along with us over at The Paper Players this week! Brenda, this is such a fun card! I love the sentiment! The tone on tone stamping is perfect! So happy you joined us at The Paper Players! Hope you will join us again!